A small Israeli force entered northern Gaza at daybreak Monday, but the military said it was a routine mission. Large Israeli forces have been gathering across from northern Gaza, ready for an order to invade and take over areas where militants fire rockets at Israeli towns. Israel is trying to keep up pressure on the Hamas-led Palestinian government to free a soldier captured eight days earlier. The movements followed a warning from Israeli Prime Minister Ehud Olmert that he told his army to "do all it can" to free the soldier, Cpl. Gilad Shalit, 19. Late last week Olmert called off an invasion of northern Gaza to give diplomacy a chance to work, but he signaled that Israel is running out of patience. Egypt headed efforts to reach a solution through diplomacy, but there was no sign of progress, nor was there any concrete evidence about the condition of the soldier, captured in a cross-border attack by Palestinian militants on June 25 that also killed two soldiers. Israel refused to discuss the captive with the Palestinian militants and rejected out of hand its demand to release Palestinian prisoners. Leaders of various Hamas branches denied responsibility. But in the week since the Israeli soldier was captured, Palestinians have come together and have come behind their government, sharing the view that something must be gained for all this pain, CBS News correspondent Sheila MacVicar reports. Additional Israeli troops moved into place across from northern Gaza on Sunday, showing clear preparations for an invasion. For months, Palestinian militants have been using northern Gaza to launch homemade rockets at Israeli villages near the border fence, and Israel has been unable to stop the barrages with repeated airstrikes and artillery attacks. Early Monday Israeli artillery hit a house on the outskirts of the northern Gaza town of Beit Hanoun, Palestinians said, slightly injuring one person. Around the same time, Israeli aircraft went back into action, hitting several targets around the Gaza Strip, including a building in Gaza City where the Al Aqsa Martyrs' Brigades has an office, Palestinians and the military said. Al Aqsa is a violent offshoot of Palestinian President Mahmoud Abbas' Fatah movement. A missile struck the second floor of the two-story building, setting it on fire. No one was in the office at the time of the attack, after midnight. A family living on the first floor escaped harm. 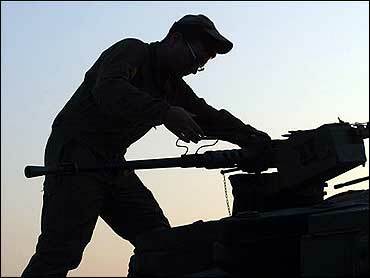 Other targets Monday were empty fields and a building in northern Gaza, Palestinians said. Shelling from the sea, Israeli navy gunships aimed at a beachfront Hamas camp but missed, Palestinian security officials said. Before daybreak Sunday, Israeli aircraft blasted the office of Palestinian Prime Minister Ismail Haniyeh of Hamas. "This is unacceptable," Haniyeh said after inspecting the damage. "This will not break the will of the Palestinian people." On Sunday Israeli troops shot dead three armed Palestinians near the long-closed Gaza airport in southern Gaza. Two of them carrying explosive belts, and Israel said they were planning a suicide attack. Two bodies of Hamas militants were brought to a hospital in Khan Younis early Monday, and Palestinian officials said it was unclear if there was a third. Israeli tanks that invaded southern Gaza and took up positions opposite the town of Rafah on Wednesday have not advanced since then. Also Sunday, Israel took steps to head off a humanitarian crisis following Israel's tight siege on the seaside territory and its destruction of the main Gaza electricity power station in an airstrike Tuesday. With hospitals warning of disaster if fuel for their backup generators runs out, Israel opened the Karni goods crossing and the Nahal Oz fuel terminal. The military said 50 truckloads of basic food products were transferred to Gaza through Karni, and the Nahal Oz terminal supplied 1 million liters of diesel fuel, 80,000 liters of gasoline and 200 tons of cooking gas. U.S. Secretary of State Condoleezza Rice called Olmert on Sunday to discuss the situation, Olmert's office said in a statement. Olmert told Rice there was no humanitarian crisis in Gaza. U.N. Secretary-General Kofi Annan also expressed concern. Olmert told his Cabinet on Sunday that he had instructed the military to "do all it can" to get the captured soldier back safely, adding that the offensive would end immediately if he was released, according to the official in the meeting. Egypt has been working to broker a compromise to free the soldier and end the standoff, but negotiations were complicated by confusion over who is in charge. Prime Minister Ismail Haniyeh's Hamas-led government said it has no contact with the kidnappers. The militants holding Shalit are presumed to answer to Hamas' leader, Khaled Mashaal, who lives in Syria. But Hamas' foreign leadership denied having any authority over the matter. "We have no contact with those holding the prisoner," said Osama Hamdan, a top leader of the Islamic militant group who is based in Lebanon. Egyptian President Hosni Mubarak was trying to enlist Syrian President Bashar Assad's help to persuade Hamas leaders to release Shalit, while Egypt's intelligence chief was talking with Mashaal directly, an Egyptian official said. The efforts were continuing, "but time is not on the Palestinians' side," said the official, who spoke on condition of anonymity because of the sensitivity of the talks.